A week ago, the updated FreeRTOS V7.5.0 has been released on FreeRTOS.org. So time to have my Processor Expert FreeRTOS component updated as well :-). Keil µVision 4.x is now officially supported with FreeRTOS, and an example project can be found on GitHub here. V7.5.0 comes with improved and multiple scheduling support. I noticed that the code size of my application was reduced by a few hundred bytes by this which is always welcome. vTaskList() and vTaskGetRunTimeStats() are now considered ‘legacy’. I’m still using them in my Shell command line interface implemenation, but they will be replaced with using the more portable uxTaskGetSystemState() implementation. vTaskIncrementTick() is now called xTaskIncrementTick(), as it returns now a value. The return value tells the caller if a context switch shall happen. This is reflected now in all ports supported. The RTOS core is PC-linted, and compiles without warnings on supported compilers. Additional details are in the FreeRTOS release notes. 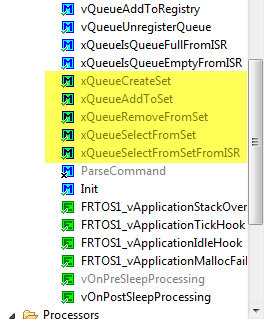 Queue sets had been added in FreeRTOS 7.4.0, and have now an UI in the Processor Expert component. 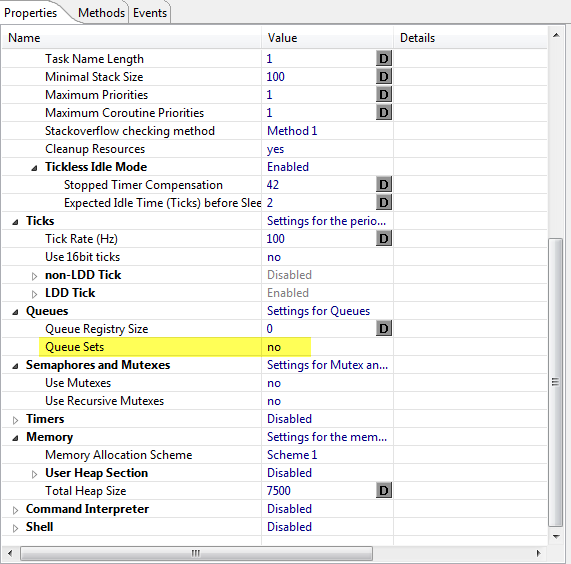 Queue sets provide a mechanism to allow an RTOS task to block on a read operation from multiple RTOS queues or semaphores simultaneously. The Processor Expert FreeRTOS component has been upgraded to the latest version of the FreeRTOS with many improvements. With a single Processor Expert component, 7 different Freescale microprocessor families, 5 IDE’s and 7 different compilers are supported :-). I have exported the components as *.PEupd files on GitHub. This entry was posted in ColdFire, CPU's, Embedded, Embedded Components, FreeRTOS, HCS08, Kinetis, Processor Expert, S12, S12X and tagged arm gcc, Building, CodeWarrior, Eclipse, Embedded Component, FreeRTOS, gnu gcc, open source projects, Processor Expert, software, software project, technology, tool chains by Erich Styger. Bookmark the permalink. I’m a fan of this component Erich, thanks! Special thanks for your time exporting the .PEupd version! a sample program. I can copy , delete, look a file using your example, but not write or read a text file. Yes, Eric. I am using your USB MSD Host for the Freedom Board . It is working fine, however, If I want to write or read a text file for data logging , there is no such command. copy,cd,dir,rename commands are working fine. yes, there are no shell commands for ‘data logging’, because that’s the job of the application. I mean the shell has no idea what you are going to log (temperature? accelerometer? something else?) and in which format. You have to implement this in the application. Hi Erich, I am a fan of your website. I am interesting in creating a log file using USB Flash Memory. I used VINCO for reading and writing to USB Flash Memory, but now I am trying to use KL25Z128 to read and write to USB Flash Memory. VINCO has function to read and write to USB Flash Memory, but I do not see read and write function to USB Flash Memory in Freedom_USBHostMSD project Could you give me a hint as a starting point to read and write to USB Flash Memory using KL25Z128? thanks :-). The Freedom_USBHostMSD project is using a file system (FatFS). With this one, you can read/write files. It would be possible to use the low level functions to read/write directly the FLASH blocks, but that’s probably not what you want. You can use the normal f_open(), f_write(), f_read() and f_close() functions. I am a beginner for FreeRTOS, and try to implementing it into my S12G128 board! However, once I try to import *.PEupd into CodeWarrior v5.1 that got the warring message, unkown file format; not sure my procedure correct or not, but does this support v5.1 platform? Have you used the menu Processor Expert > Import Beans (or something like this) to import it? One thing I have seen that depending on your internet connection the download might result in a corrupted file. You might try to re-download the files again. Or better download them as a .zip file. On GitHub there is on the right hand side a button ‘Download ZIP’. I am also porting FreeRTOS on S12G128 on a bareboard. I am a beginner. I just wanted to ask what if I dont want to use Processor Expert. What all files I have to import in my project and what all things I have to modify accordingly to make FreeRTOS run? why don’t you want to use Processor Expert? It makes things so much easier, especially for a beginner. And if you do not like it, you can simply take the sources and use it without Processor Expert. I recommend to give it a try. That’s funny. In my previous job developing software for the automotive industry the requirement was to use code generation tool like Processor Expert as this improved the safety and reliability of code :-). Maybe you have missed it, but there is a non-PEx port available for HCS12 in FreeRTOS (e.g. V8.0.0) under Source\portable\CodeWarrior\HCS12. Thanks for the PEx components and posts,I have a problem when I am trying the freeRTOS component on myFRDM K25 RevD board with a simple task project with a para passed to task. If the parameter is pointer to a int, it works fine. But with a pointer to a struct, like the following code, the value of the element in the structure gets lost. I checked pointer address for the structure, it is the same in task create function and in the task. and FRTOS1_xTaskCreate() returns okay. Are you really passing the address of the struct in xTaskCreate(), and you are properly casting it in the task itself? I see that you are using printf() which is a very bad thing: I think printf() causes a stack overflow or something like this to you. Please try this without printf() (see https://mcuoneclipse.com/2013/04/19/why-i-dont-like-printf/). The other thing is: you have the variable ‘foo’ on the stack before calling vTaskStartScheduler(). While I think that’s ok (but dangerous too, as the RTOS will switch to its own stack), can you try to have ‘foo’ as a global variable? Dose freertos use the svcall service? There is no code to trigger the svcall interrupt. The Lowest Interrupt Priority =3. If I set the ARM Family to M4, the project compiles without error. Is this a bug, or is there a work around for the M0+ setting? no, this is not a bug. Freescale deciced to spend 2 interrupt bits for the ARM Cortex-M0+ cores, so you have priorities 0, 1, 2, and 3. I recommend that you set the ‘RTOS/Library interrupt priority to 3, and the ‘Max SysCall’ on e.g. to 1.
there is an other problem, when you using freertos component in PE with m0+, the interrupt priorities is not setted correctly. Could you be more specific what you mean? What exactly is wrong? Thanks! this just not a porblem, its a place may go wrong when using the component. Ok, I see. The component does not automatically change the priority settings. By default it is using M4. If you then switch to M0+, it does not overwrite the previous settings. I was thinking about automatically changing the RTOS priority say to 3. But I was afraid that if someone changes from M4 to M0+ (just to check it out), his M4 settings are overwritten. Are you suggesting that overwriting the M4 values with M0+ levels (e.g. with 3 and 1) would not be a problem? I should be able to do this :-). Let me know if this is a bad or good idea. I just install FreeRTOS(V7.5.0), working in CW10.5 and wict a S08 MCU, but I can’t set SWI correct proporty. after build and inspect ‘Vectors.c’, vPortYieldISR have been set to Vrti, but not Vswi. 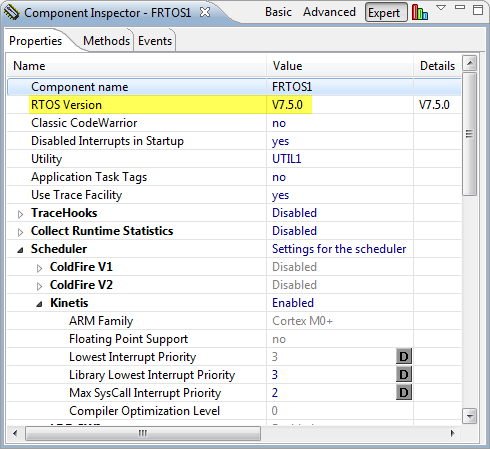 In the Components view, click on the FreeRTOS component and unfold it: you should now see the ‘InterruptVector’ component. Clock on it and use the ‘Inspector’ context menu. In the Component Inspector view, set the interrupt vector to ‘Vswi’. ok, let me know if there is anything else. It looks like this FreeRTOS port actually does not support floating point…. I believe a function vPortTaskUsesFPU() should be defined, and some other stuff, for this to work? Hmm, it should, but I admit I have not used it much on a M4F with floating point enabled. Which CPU are you targeting? Have you set the processor to M4F in the FreeRTOS component properties? I’m targeting a K20F120… yes in the PE component I have M4F and floating point support set to yes. I’m also pulling in standard libraries so I can get libm, including math.h and using a sin() function. Oddly, using sin() in one place worked OK, but when I added it another place the whole thing hard faults… maybe I’m doing something wrong, I’m still investigating, but it seems there should be some stuff going on (unless that’s for older versions of FreeRTOS, lots of stuff out on the web, it’s not clear 10% what’s current…). The latest version is 8.0.0. I have not touched the floating point support for a while. What is different with enabling floating point is a) that FPU is enabled at RTOS start and b) the stack frame/context switch is checking if floating point is used in the task. At least with the small examples I used, that was working fine for me. Hmm I think I was looking at Cortex A9 code… I just checked https://sourceforge.net/p/freertos/code/2224/tree/trunk/FreeRTOS/Source/portable/GCC/ARM_CM4F/ and don’t see any of that stuff… so I think I have a problem somewhere else. Sorry to bug you! FYI I fixed my problem by defining __VFPV4__ in the compiler preprocessor section. Without that, my function entered by doing a push then a vpush which crashed. Maybe this is not set for you? I had all those options set already, but that define wasn’t defined… and I was digging thru library code and saw that it probably should be, so I tried it and it worked… maybe it’s an artifact of the way I made the project (based on your blog post on how to get PE running with C++, editing the .cproject file etc)? Not sure. I have to admit that I played only a little with floating point: I avoid usage of floating point whenever possible. Adding a define sounds odd to me. Where you using CodeWarrior (EWL libraries) or something different? I think I found a bug… when you enable the shell, and have memory management scheme 3 (wrapped malloc), then the PrintStatus function in FRTOS1.c should not include the ‘free heap’ report, as there is no FRTOS1_xPortGetFreeHeapSize and AFAICT no system call to find out available heap space…. …and a worse one… it won’t run at all. gets a malloc error upon creating the first task. Appears to be due to the GCC/Kinetis malloc routine checking for collision with the stack by checking the stack pointer, which FreeRTOS sets in the heap (reminded of that here http://www.lpcware.com/content/faq/malloc-failure-using-freertos-heap3c-lpcxpresso-tool-chain). I really don’t want to recompile the EWL library (looks like if it were with alloc.c::HEAP_GROWS==0 that might work)… not sure what the options are. Maybe, in the heap3.c wrapper, saving SP, setting SP to SP_MAIN, doing the malloc, then restoring after? I think I have never used the malloc scheme. I agree with you, recompiling the EWL libraries will be a night mare. I assume you have your reasons why to use malloc() for the rest of the application? I usually avoid using malloc() from the library, and instead I’m using the FreeRTOS heap malloc. Would that be possible for you? The reason is that I’m trying to integrate C++ functions with FreeRTOS (namely, parts of https://ccrma.stanford.edu/software/stk/). C++ uses the system heap for new() of course. If I use one of FreeRTOS’s private heaps, I have either lots of wasted memory or lots of time tuning the two heap sizes, both of which I’ve tried and I’m not really happy with those solutions. It would be so much better if they were unified. I know people complain that malloc is dicey but I looked at the code in the EWL malloc and it’s not bad at all, it’s comparable to heap_4 in size and complexity. I think the claims of indeterminism of malloc() are true but way overblown. In any case I posted the question to the FreeRTOS SF group as well… considering how FreeRTOS uses the stack pointers in the ARM, I don’t see how it would ever work with EWL – other ARM vendor’s mallocs might not do a heap/stack crash test the same way, though it looks like LPCWare might have the same problem. I would add that, if one were to want to use FreeRTOS for a packet processing application like using LwIP, I would think that malloc’s slightly more advanced memory coalescing would be a great benefit over heap_4, since that kind of application has to constantly create and destroy varying sized structures. Otherwise you’d be stuck with your own memory management using a pool, etc. yes, that’s kind of what I expected. So far I had not had the need to use the normal malloc() (lucky me!). I’m affraid that I’m probably not of a big help here. I saw your message in the FreeRTOS forum, so I hope there will be a solution. actually got kind of a ‘not our problem’ response, but I figured out a solution. I’ll email you the code, take a look.